Enjoy a tasty combination with this Cinnamon-Apple Fruit Snack Recipe. Buttery crackers topped with apple slices make for a quick fruit snack recipe. 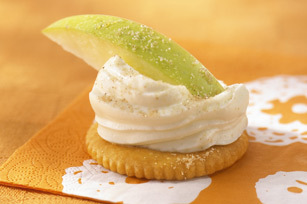 Spread crackers with reduced-fat cream cheese; top with apples. Substitute fresh peach slices for the apple slices.